A six-day teachers strike in January was not only a watershed moment in Los Angeles Unified School District history; it set the stage for a May 14 special election for an open seat on the district's school board. 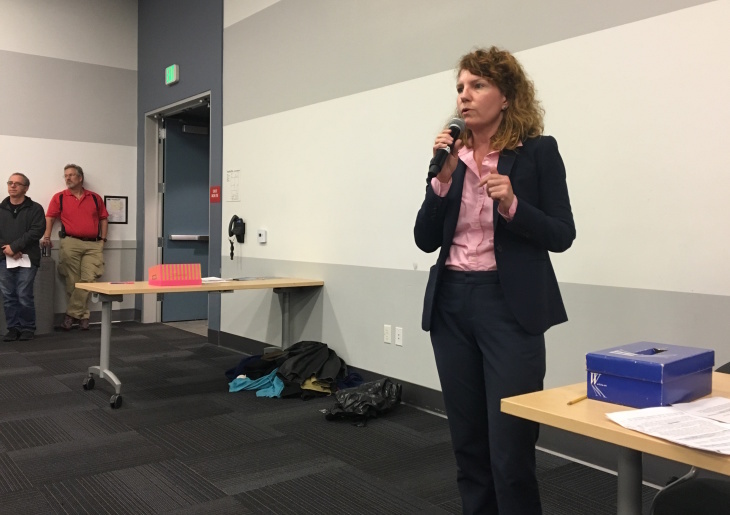 "The strike actually ran right through the race and right through all of our campaigns," said Heather Repenning, one of two candidates who advanced from the March primary to the May runoff. Repenning recently stepped down from the L.A. Board of Public Works to run for the school board seat, which represents parts of both northeast L.A. and the southeast cities. The mother of an LAUSD second grader, Repenning was a longtime aide to Eric Garcetti, working for his city council office and helping to lead his 2013 campaign for mayor. Now, it's Garcetti's face all over Repenning's campaign literature. She's running against Jackie Goldberg, a former LAUSD board member, city council member and state assemblywoman. Both candidates spoke recently with KPCC/LAist. The following is a transcript of KPCC/LAist's hour-long Q&A with Heather Repenning. Her answers and our questions have been edited or condensed for clarity and length, so directly quote from this story with caution. Kyle Stokes, KPCC/LAist: How do you think the teachers strike shaped this race? Heather Repenning: The strike actually ran right through the race, and right through the middle of all of our campaigns. The most important thing to me is how is the strike going to shape the conversation around public education. And I think overall, I think the impact will be a very positive one. The overwhelming message was that we need to invest in public education. We need to invest in our neighborhood schools. We need to make sure that our students have the basic people and resources in place so that when they get into the classroom, they can succeed. We want to make sure that our teachers have a manageable class size. We want them to know they're not alone in educating our children. We've already seen that there's legislation happening in Sacramento as a direct result. We've already seen that there's going to be a ballot measure on the June for voters to look at the possibility of a parcel tax to fund education. Q: Were there any lessons you learned during the strike? The lesson is that people care. That is a very hopeful takeaway for me — that people actually do care, and they're ready to fight. They want to see our students succeed. They want to see our schools succeed. Q: Does that mean that people didn't care before the strike? It's been a while in our city since public education has been at the top of the conversation. These statistics about California ranking in the bottom 10 among the 50 states in the U.S. for per pupil funding — we've been using that statistic for as long as I can remember, and no one's done anything about it. We have Donald Trump as our president. We talk all day, every day about California being "the resistance." But we cannot claim to be the resistance to Donald Trump, while we're underfunding education, which we've been doing for a long time. Q: Have you seen tangible evidence that the strike changed voters while you were out campaigning? First of all, I stood with my second-grade daughter's teachers on the picket lines, I thought that that was important. I support teachers 100%. Overall, you know, the sense of wanting to support teachers and invest in public education has been a very clear message of the strike. That's impacted the campaign. I know, it's impacted, you know, the way voters are thinking about issues. Another example of that: charter schools are not popular. I think one of the big messages of the strike was that we need to put a check on how charters are impacting our local neighborhood schools. So I think that the strike has influenced the tone. There is a stronger sense of people wanting to fight for LAUSD public schools. Q: During that teachers strike, we all got used to this debate over how much money LAUSD has to spend — and what it means to have a $2 billion reserve. United Teachers Los Angeles claimed that there was $2 billion that district officials were hoarding and refusing to spend. LAUSD officials said that was misleading, that they had already committed to spend basically all of this money in order to avoid a deficit. Who do you think was right in that debate? I think the truth was somewhere in the middle. I think that there was more money to spend — because the district did end up spending it in the strike agreement — but there was not that much more money to spend, because the third year of the strike agreement is currently unfunded. Everyone agrees that the class size reductions are very gradual. A ratio that was 750 kids to one college counselor — which is crazy — is now 500 kids to one college counselor, which is still deeply inadequate. I think everyone would have wanted to see something more aggressive, but the money simply wasn't there — and if the money was there, UTLA would have found it. I hope Measure EE, the parcel tax increase, passes. At the same time, if it doesn't pass, there's going to be an issue. The district financial issues are real. Q: There was an argument that the teachers union would make: the district's projections have consistently been wrong, and are always predicated on a worst-case scenario. Do you think that's true? I don't agree necessarily with that. I think at the end of the day, it makes sense to look ahead at the possibility that the economy, the strong economy that we have right now, may not last — and to actually be carrying some level of reserve in preparation for that. Q: The L.A. County Office of Education has issued numerous warnings that the district is engaging in more and more deficit spending. They came out with a response to the teachers strike settlement saying that the new contract called for even more deficit spending and might not be financially sustainable. Do you believe what LACOE is saying? I think that their warnings are important. At the same that something is not working, we have to fix it. We can't say, "We can't fix it, because we can't afford to fix it." I think we fix it, and the resources come. If we get more people feeling that LAUSD is on the right track, more students will come back. The more students and parents feel comfortable investing in the district and being part of LAUSD schools, we end up with more resources. If we act as if we're a failing school district, that is what we will be. Q: Do you think that LAUSD is at risk of insolvency? I think that there's a risk of the district being in a bad financial situation. I think it's very important that board members are able to look at the whole picture. I think the goal every day should be: how do we put more resources into the schools? How do we make it work for our students? So if it comes to it making cuts, we start with the things that are going to have the least impact on our students in classrooms. Q: You're portrayed as a moderate and a realist in this race. It feels like there's a very fine line that you walk in being realistic about the district's financial challenges. Board members want to be realistic, but if they talk too much about the district's financial challenges, there's a thought that charters and private schools profit off of that narrative. I've heard from parents who've said that they've heard, sort of in the ether, that the district's going to go bust in a couple years, so why would they send their kids starting kindergarten to one of our schools, if we're going to go bust. We have to talk as if we are going to be successful, as if we are successful. It's important to project confidence, and to be confident. At the end of the day, what matters is student achievement. You call me a "moderate," but I'm a die-hard progressive. I've been very active in the Democratic Party. I don't believe that a school board should reflect the gridlock of Washington, D.C. Two great examples of gridlock recently: First, the inability of the school board to agree on an appointed representative to hold this seat, which has been sitting vacant for months. Second, the strike. Neither of the two sides in LAUSD politics — one representing charter school operators, one representing unionized teachers — is directly representing our kids. I don't like saying this, I don't mean to be anti-teacher, I love teachers; I'm also not anti-labor. We need voices on the school board that are going to talk past this ongoing war. I'm a parent. To me, this is not theoretical. I am dependent on our public education system to educate my daughter for the next 10 years until she walks across the stage and gets her LAUSD diploma. So I understand the urgency. I do not believe that things are black and white. We're doing well by some families and some students. But access to good LAUSD schools is not universal. And I'm running to really make it more universal. Q: Very early in the race, a group of Latino candidates called me to a restaurant in Highland Park to say, "We're worried the major endorsements in this race are all going to white candidates." Do you think it's correct to say this is a "Latino seat"? It is correct. I actually believe that the lines need to be redrawn after the census comes back to make it a lot easier for Latinos to be much more competitive. The way the district was drawn 10 years ago doesn't quite do that. Then you add to the changes and that some of the neighborhoods — especially in the north, with gentrification and whatnot. I've lived in this district for 18 years now. I've lived in Eagle Rock. I've lived in Silver Lake. I currently live in Los Feliz. I've spent really my entire professional life in this district. The seat opened up. It's where I live. It's where my child is in school, so I ran for it. I do speak Spanish. I spent time teaching in Central America. I also spent time working for LAUSD organizing parents. I worked as a field representative for a city council member. So I've spent a lot of time working with Latino and immigrant parents and families. Also, in my work in the field on the city council. So I can communicate directly. But also, as a parent that is just really working hard to get the best possible opportunities, I think, that is a universal trait parents all share. Q: You're campaigning against a political fixture in Los Angeles. Your opponent has high name recognition after years of running citywide races. How can you convince voters to take a look at you when Jackie Goldberg is, at least, a known commodity? That seems like a difficult hill to climb for you as a candidate. The real underdog in all of this is our students. The hill I have to climb in this race is nothing compared to the everyday challenges that LAUSD students face. Eight out of 10 of our kids are coming from families that qualify for free or reduced lunch. Ms. Goldberg was in elected office in this area for 25 years. She's certainly well known. She's certainly done a lot. She was on the board in the 1980s, and I don't think that that was a golden era of success. That was when our schools really started to get extremely overcrowded. The school board did not build new schools and instead put kids on this year-round calendar and bussed an hour each way to get to school. We lost a generation to overcrowding. To me, it's important to have someone who's going to be able to look ahead at solutions that are going to benefit our kids. Q: The California Charter Schools Association (CCSA) didn't endorse in the primary. Are you soliciting for their endorsement in the runoff? I'm not soliciting it. I've built a really big coalition: the mayor, who has been my mentor. I have almost 20 labor unions supporting me, multiple Democratic clubs, a bunch of just grassroots people. Q: None of whom spend as much in elections as CCSA has historically. You could change the game immediately by winning their endorsement. That's not attractive to you in any way? I'm focused on my campaign, so I can only control what I can control. There is this set of politics that I'm walking into. I did not create it. I'd love to see a system where independent expenditure groups play a reduced role in school board races. I would love to see a system where we have matching funds, like we do in city council races, so that those who raise less on their own get that extra help to get their message out. Q: Can you address the Eli Broad's $100,000 contribution, made on primary election day, to the independent expenditure group SEIU Local 99 set up to support you? You say you're walking into these politics and hope to rise above them, but Broad's one of the largest pro-charter donors in LAUSD politics. The money went to an independent expenditure group led by a major union that represents custodians, food service workers, bus drivers, the folks who work with our special ed students as assistants and teacher aides — and they're supporting me. I'm very grateful for their support. They believe in me. They took this contribution as part of their independent effort. And it's out of my control. Q: I don't want to ask you to do something that would cause you to violate laws against coordinating with outside groups spending on LAUSD campaigns. On the other hand, you have said — including at an East Area Progressive Democrats meeting last winter — that you didn't want charter school advocates' money in your campaign. This may not be "your campaign," but this is an independent expenditure group set up to support you. Would you ask them to give Broad his money back? We're talking about a situation where if you said "I'm not comfortable with an independent expenditure group taking this money to spend on my behalf," that might carry some weight. Would you say that? Here's what I would say: I believe in the skills that I've built in my last 18 years working in local government. I've been involved in really making government work for people. Education is very, very important to me, I believe it is the most important thing we do in our community. And I believe that LAUSD is a mess. I believe that I really have the capacity to fix it. I believe I have the capacity to directly help a lot of students get a better education and get a fair shot at getting into college, so I want to be on that board because of what I know I can do. The politics are what they are. I am not running the same type of, I would say, anti-charter campaign as my opponent. I'm not. Because I go to different places, like in the southeast cities, where as I said earlier, you know, access to good LAUSD schools is not universal. I don't believe the system for signing up for that is also not universally accessible. So people I've talked to in the southeast have talked to me about their decision to put their kid in a charter school. And so to me, I want to do better. I want parents to sign up for LAUSD. So I'm not using a lot of that same same rhetoric directing my campaign as an attack on charters. I'm going to run my campaign, I can control what I can control. I believe that I, you know, I believe that what I brought together is significant. I believe that the type of support I brought together is very significant. There's no one who's going to change my mind about things because of this spending or that spending. Q: In a lot of ways, LAUSD has bought into the notion that parents should have a long menu from which they can choose a school for their child — not only with charter schools. There's an economy of public school choices (magnets, dual language schools, other themed programs) that has sprung up either in response to charter schools or on a parallel track to charters. Is this or is this not a good thing? Parents want to be able to choose. As a parent, you are going to look at every school option that's within your reach, you're going to evaluate it, you're going to make the decision that you think is the best one for your child. And that is your job. There are few things you do as a parent that are more important than in deciding where you just send your young person to school. I'd like LAUSD to be the de facto option for parents. That's not what it is right now. We have a long way to go in terms of student achievement to get there. Parents don't really care what kind of school it is. Parents want to know that their child is going to be safe, and that when the student is not progressing, that someone there at the school can catch that. I want us to offer that to every parent. I don't think we're doing a good job of that right now. It's not that we're falling down on offering school choice. It's that our neighborhood schools are not always strong enough. Q: My observation would be that we spend a lot more time talking about school choice issues, not on school quality issues. We're wrapped up in the charter debate or concerned about whether a school has a magnet or a dual language program. Would you agree with that statement? Yeah, I think that options are really important. I think the district should be able to offer its own options and individuals, individualized types of curriculum, different sizes of schools, schools that are going to bring out the best in different types of learners. I don't think that we should walk away from success in our neighborhood schools. It's great that you know, that we have some good magnets, and we have some good things outside of those neighborhood schools. But the basic unit, I think of our school district is the neighborhood school — and I think it's very important that we continue to figure out how we're going to find success at every neighborhood school. Q: "Walk away from success in our neighborhood schools" — can you unpack what you mean by that? I mean taking as an assumption that our neighborhood schools are not good enough. Parents who choose a charter, I think a lot of times that is in response to the fact that they don't feel their neighborhood school is going to be the best place for their child. So in response to parents going to a charter than the district has gone to wanting to provide its own set of options, which I think is important. But to me the question is, "How do we get back to making our neighborhood schools strong?" I think that every family, they should have an LAUSD neighborhood school that they can look at and say, "Okay, that's a good school," even if they end up choosing something else. Q: With magnet schools, there's a school of thought that they no longer serve their original purpose as a way to desegregate the district. Do you believe that magnet schools still serve a desegregation function? No, I don't. I think magnet schools are not universally accessible. I know that the district rolled out a unified enrollment system to try to address that and make it easier. But getting your child into a magnet school is still not easy for parents who may not speak English or who may not know how to work the system. Q: Do you support a moratorium on charter schools? I've said that I would have supported the district's resolution asking the state to look at a moratorium. Charter laws are governed by the state — and that's something that complicates the debate for school board races, because people want to ask school board candidates whether you support a cap. But this actually has to be decided at the state level. I do think that it's important for the district to be able to provide more transparency, more accountability than we currently have. Q: So you would support asking for a moratorium as the school board did, but in the end, does that mean you would not support the state actually imposing a moratorium or a cap? Given that you support the idea of at least asking the state to study this for some time, what course of action then would you advocate the state take? I would advocate that the state give more authority to individual school boards. We're the regulators, but we don't really have a lot of teeth. As far as a cap or a moratorium, these are very heavy-handed policy tools. I don't know if we're talking about a permanent cap. I don't know if we're talking capping it at the number of charter schools we have now. There's no proposal on the table. These are really serious issues. I'm not going to take a theoretical position on a theoretical proposal. Q: You say school boards should have more authority to regulate charter schools. Authority to do what? To say no. To guide where might be the best places for a new school to open or what types of schools would complement what we're already offering. I want to ask questions about how is this going to help our students. Q: Yes, LAUSD's hands as a charter regulator are somewhat tied by California's charter school laws. But given the power that the board does have at its disposal as a charter authorizer right now, are there any concrete steps the board could take right now to make this a little bit less of a zero sum game? The idea behind charter schools was to innovate, and to provide, to show some best practices. I think that some of the charter schools have done that. I don't see where we've gone and looked that and said, "How can we how can we learn from this?" There are some really important lessons. I don't believe that the two systems should necessarily be kept completely separate, looking at each other over a fence. Q: The most consequential decision a school board member can make is to hire or fire a superintendent. Do you think Austin Buetner is doing a good job in that role? I think it's still pretty early. He did settle the strike, and that was a big test. I don't think he did particularly well going into the strike. I think a lot of his communications fell flat. I think he really didn't have any trust from the community. At the same time, the strike could have gone on for a lot longer. He did settle the strike. I think that was a very, very important test. Consistency and stability and leadership is very important for major agencies, like LAUSD. We've had a lot of turnover in superintendents over the last 10 years. I think it's important that he passed a major test. And so now I would say let's give him the chance that he's earned to show us what he can do. If I get elected, I think I will want to be very close to him, and I will bring my agenda and my ideas to him. Q: At the time Beutner was hired as superintendent, current board members were criticized from some corners for hiring someone without any background in education. Do you believe that Beutner should have been hired? I think that there should have been more of a public engagement process around his hiring. If he truly was the best candidate, I think public engagement is good — the outcome is always stronger. Q: You mentioned the need for strong schools in every neighborhood. Why do you think that all schools are not excellent right now? What's the sort of root cause of that issue? I just don't know that we're wrapping our arms around them the way that we should be. To walk around to the principal to say, "Hey, how are you doing? How can we support you? What do you what do you need here?" The district's really big. So one of the frustrations I have is the large number of schools. As a board member, I would really want to be hands-on. So I think, how are we really wrapping our arms around the individual schools and saying, "What are the issues? And what are the opportunities that are available? And how do we make those things happen? How do we get give you more control?" I don't think that there's a silver bullet. Q: I'm not asking for the silver bullet — the solution. I guess I'm wondering what your diagnosis of the root problem with LAUSD is. We have these incredible people that show up to work every day and they're trying to make things work with not enough resources. We need to uplift these fundamental organizations that are our neighborhood schools. I don't think we've done that for a long time. It should never be about just getting through the school year. It should be about what is the larger vision, what is the larger plan? For me, I look at: how can we put some of our best teachers in our, you know, lowest performing schools. Is there a way that we can incentivize good teachers, good principals, to go? I want to make sure that, you know, we're able to have real, after-school academic support at every single campus. It's important to me that our schools be real community centers that are able to serve the multiple needs of children, including mental health and nutrition. In the wake of the college admissions scandal, I want to figure out how we can level the playing field when we know that the system itself is deeply unfair. How can we make sure that we have college guidance counselors, prep for standardized testing, help for students filling out applications for college and for financial aid? Parent engagement is very important to me. I think the district needs to do much better job and engaging parents. Correction: This story was updated at 2:30 p.m. on Tuesday, April 16, to correct a sentence that erroneously quoted Repenning as talking about "class sizes" when in fact she was talking about "student achievement."